How can your business get what it really wants and needs from IT? How can your business aim to survive, even in environments of unpredictable change? The answer is business agility. A revolution in how we think about architecture, about software development, about IT supporting the business, and in how we think about leveraging new platforms such as cloud computing, The Agile Architecture Revolution reinvents Enterprise Architecture as you know it to support continuous business transformation. Laying out a multidimensional vision for achieving business agility through agile architectures, author Jason Bloomberg reveals how your business can—and indeed, must—build a system that can change its behavior and data semantics on-demand, in support of your changing business. Both visionary and realistic, The Agile Architecture Revolution looks at the convergence of concepts that have the power to change the way we think about software, and finally bring IT back to a place of productivity and value. The pace of change in business has once again accelerated, except now the context for this change is far more complex than the simpler, one-dimensional dot-com days. The evidence of revolution is all around us—it’s time to identify individual trends and tie them together into a single story of transformation. That’s The Agile Architecture Revolution. All about how business—that is, people—use technology to meet changing business needs, The Agile Architecture Revolution will open your eyes to a new way of thinking about technology, about business, and—about change itself. Join the Agile Architecture Revolution! 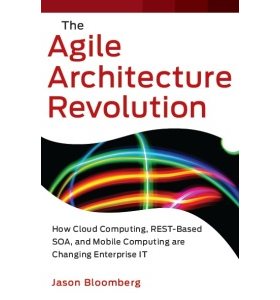 The Agile Architecture Revolution: How Cloud Computing, REST-Based SOA, and Mobile Computing Are Changing Enterprise IT by Jason Bloomberg is now available.